"Makes you wonder what caused their collapse if the were so advanced", Hassic remarked. - The collapse of their civilisation is just but one of many possibilities.- Zayl said. - For they bear the knowledge of how to travel between worlds. It may very likely be that they abandoned this world as they did with so many others. We theorise that the remnant of their civilisation is still out there, maybe still fighting their adversaries in their never ending fight, which may have lasted for eons. - So you're not of this world as well master Zayl?- Aellis asked. - You're right. We're not. We have used the same means of travel that the Old Ones used. They were masters in building portals, and there is one of them in each world that they had inhabited. Yet, once you cross over into another realm, you cannot go back through the same way, mostly because there were no portal structure on the other side where you arrive, only the rift itself, which would close after a few moments. We're yet to deduce why the Old Ones did it this way. Safety reasons? Or something else? We don't know. What we do know however, that each of the Fortresses left behind by them are treasures troves of artifacts as well as knowledge. Morn listened to the lecture of Zayl. He was puzzled, there was no doubt about it, yet the curiousity within him had only been fed some tiny crumbs. This sorcerer, this Zayl was no doubt an interesting being, and Morn definitely liked to hear more. Other worlds, ancient race of powerful beings... This was a tad too much for Aellis, nothing she faced before had prepared her for this. She was doubtful, as the Stranger's story was certainly that of the mythical scale, yet he did spoke very confidentally about the subject, as if he had seen these Old Ones personally. - Tell me - She said. - Did you ever encountered those Old Ones? As in, them... you know, being alive? Zayl turned around to look at Aellis. Red eyes glowed from beneath his hood. - No. We haven't. Not for the last five hundred years. And even then, he was on his last dying breath. And spoke to us in a strange and foreign tongue, one we're yet to understand. - What did he look like? - Aellis asked again. - It is hard to describe them in proper my dear. They are a tall people, very reminiscent of you, humans. Yet they have blue skin, and orange eyes, the lot of them. Few, as I have seen in the murals depicting their history, are born with silver eyes instead. Those Old Ones are the nobility caste of their culture, or at least we theorise that way. They are beautiful to look upon, even the most ancient of them, yet have a spine chilling presence to them. You cannot just gaze upon them without feeling any sort of discomfort, or in some cases, even fear. I suspect that there will be more murals inside the fortress depicting them, so you can see for yourselves. Hassic listened to Zayl's story with utmost attention as he found the subject mind-boggling, but very interesting. In fact, nothing he had ever heard came close to being as interesting as what he's heard right now, and, at least for a moment, dark thoughts of his family and revenge were replaced by daydreaming about all manner of things the expedition might encounter in the Fortress. - "How intriguing." - Cassador nods, slightly overwhelming him what other things are out there in the universe. - "Anyway, as far as I am concerned, if that masked woman doesn't arrive soon, we may as well proceed. Before we do, what does this cube look like, and where can we expect to find it?" - It is just that. - Zayl said.- A cube, not bigger than a fist, etched with glowing runes, usually black in color. Our research points that the fortress we're heading now has an intact one inside. 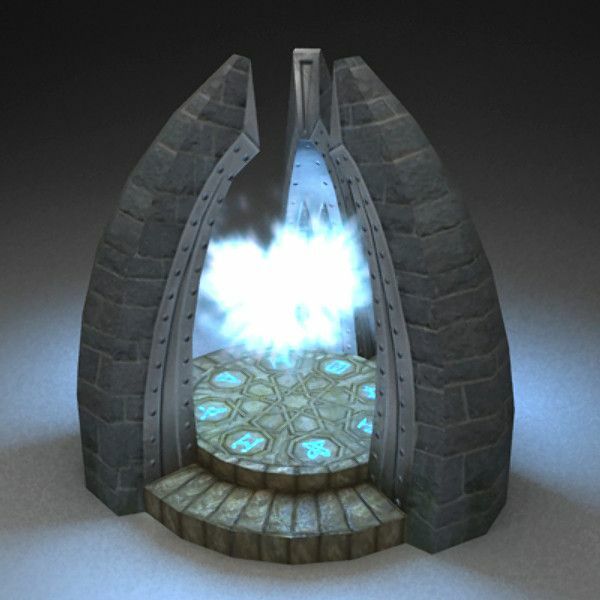 There is usually a special room, with an altar or a pedestal in the very middle on it. "And chances are it's very well protected, right? ", Hassic asked, "Much more than the outer parts of the Fortress, that is." - It's a high possibility, yes. - Zayl said. - The Old Ones certainly didn't want anyone getting their hands on the artifacts that they've crafted. Their adversaries were the main concern. "Ah, so there were more beings than just the Old Ones back then? ", Hassic replied. - There are indeed. Their adversaries have been feuding with the Old Ones. The only name for them that We've found is that the Old Ones called their enemy "L'taah". Not much else is known for us at the time. Why they started warring is another mystery. Fight for influence perhaps? One must only wonder as of now. As the group walked and Zayl continued his little lecture, dusk settled in. fields of withering grain had changed into a forest surrounding the road on both sides. Morn suggested that the group should break camp in a nearby grovekeeper campsite, now currently unused. Soon enough, a fire was going, and meager rations were shared. Morn warned everyone as not to wander in the woods, and don't try anything stupid, like setting up a snare, as there were no doubt other Grovekeepers patrolling the woods, just looking for an excuse to loose an arrow. Hassic sat by the fire and chewed on the hard bread with jerky that had been given to him. After a few moments his thoughts shifted back to those of his childhood, back when his family was still strong even after fleeing from Araraq, back when they could afford quality food in generous amounts, back when he couldn't realize that his parents were trying to give their son a normal childhood, free from the troubles of the twisted world. He reflected on those days, and for the first time ever he thought about the things which happened above his childish comprehension. He remembered how often his father would stay on his trips, which lasted weeks, sometimes months; he remembered how often he'd bring hauls of meat all through the year; he remembered how often he'd have wine barrels rolled down into the cellar, but always complain that there is no more wine. All of this Hassic took for granted, but only now did he start to realize what was really going on. He snapped back from his thinking to find the group sitting in complete silence, apart from the sounds of animals coming from the forest. Morn took out his canteen - filled to the brim with distilled mead, took a sip and passed it around the campfire. - By tomorrow noon we should reach the first fortress. - Zayl said, as he passed the canteen back to Morn, as he was the last to drink. - after a bit of rest, we'll delve inside. get a good night's sleep. - We need to place a watch every couple of hours. There may be bandits in the woods as well - Morn said. - I'll go first. As Cassador was roasting a piece of meat over the campfire, a thought struck his head. - "Curious. Do you know anything about other fortresses? Pretty certain I heard there was one north of Lordsport, and one even to the southwest of that city." 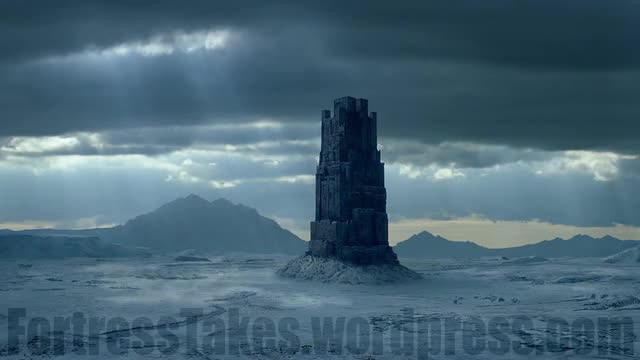 - There are nine out of ten Blackstone Fortresses build by the Old Ones on this realm, which are still standing. - Zayl said. - And yes, two of them stand in the chain of isles you call Aleria. But unfortunately, we do not know much about them other that they still stand. but we did heard a sort of tale about the tenth one. A creature called Ignehoreus destroyed it and made it into it's lair. It takes quite amount of power to destroy these monoliths. What was this Ignehoreus? We've heard only it's name uttered with a bit of fear to it. - It was a great dragon - Aellis said. - Tales tell of it being as large as four Alerian man'o'wars, large sailships in their own right. It used to terrorise Aleria, and the coastal cities of the mainland. It was slain over three hundred years ago. There are many tales on who did it though, and each kingdom has it's own version on who slew the mighty wyrm. In the Clanlands, where I was born, the tale tells about Iagan One-Eye of the MacGreggor clan, who shot the beast down with balistae. - And the others?- Zayl asked. - People from Nornheim tell the tale of Jarl Olaf Haraldson and his fight with the dragon in it's lair. - Aellis tried to remember all of the tales about the last dragon of Niveria.- People from Araraq speak of Saint Loren, a paladin of the Lightsworn, who had lead his crusaders onto the wyrm's lair. The Alerians claim that Captain Edward Penworth called the Bluebeard, an Alerian privateer and whaler, slaying the beast with harpoons, like a common porpoise. And Westeri... - She was lost in thought for a moment. - The westeri claim that Prince Peter of the then ruling Steinburg dynasty defended the city of Morestadd from the wyrm, slaying it in the process, with the aid provided by the Arch-Mage of Leighbury. - Morn said. - So there's a lot of dispute over the kill of the beast. - Very interesting. - Zayl replied. After having the meal and speaking with others, Cassador utters a long yawn. He goes to the bed, promising to take the watch shift. The night at the grovekeeper campsite went quietly and without much interruptions, save for several hawk owls flying by. the next morning, after a quick breakfast the march to the Blackstone fortress was renewed. By noon, the group could see the towering monolith of black granite in the distance. It was still less than a league((1 league equals 2 miles rougly)) away. The main road circled around the fortress, avoiding it completely, so the group had to take a barely seen path towards it, trough the woods themselves. Due to this part of the woods being heavily patrolled by the grovekeepers, due to some heavy poaching going on, Morn insisted that he'll walk first, as to emulate a trail guide to a group, so that neither of them will end up filled with arrows. Zayl followed, along with the rest, while holding a map of sorts in his hands. - Not much further it seems.- he said, as the group made it into a vast clearing, and found themselves right nearby the base of the fortress. On the trails left, there was another grovekeeper campsite, this time with two grovekeepers resting in it. One was roasting something on the spit. - Greymane, is that you?- One of them shouted, as he approached to Morn. - Aye, it's me. What you've got there roasting Jon? - Some sod snared a rabbit, no need for that to go to waste, eh? - And these folk? Escorting them somewhere? - Jon asked. - Aye, that I do, to there - Morn gestured at the fortress. - Have you lads lost your wits completely? - The grovekeeper exclaimed. - Don't tell me you believe those old woman stories? - The thing's active for bugger sake - Jon said with a bit of fear in his voice. - How come? - Zayl entered this conversation. - What did you saw? - We've saw some creatures wandering about them, and then going inside. nothing I've seen before. We've nearly died out of fear last night, and Elli made a run for it back to Cragow. - How did those creatures looked like, and did you caught a glimpse of their number? - Zayl asked the terrified grovekeeper. - They've looked like lizards. Had heads of one for sure. Thank the light they've didn't spotted us out there. I've counted a dozen at least. What are those beast things? - Don't piss your britches Jon - Morn said. Zayl was taking out his black tome and browsing through it's pages. After he found what he looked for, he showed the image to the grovekeeper. - Is this what you saw last night? - He said while pointing at the book. The page at which he was pointing showed a highly detailed drawing of an L'Taah, the ancient enemy of the Old Ones. - Aye, tis be the one ser. - Then we have no time to lose, and let's hope that the sentries inside had killed most of them off. - Zayl put the toma back in his bag and turned towards the fortress. A red energy coil began forming around his right arm, eventually forming into a reddish, spectral blade. - Weapons drawn, and stay on us - Zayl said as he and the others entered the fortress. - "Welp. There go our sneak tactics away." - Cassador draws his blade out; he feels slightly good to sense an incoming battle, after all these days of mourning. - If we're lucky, the sentries would've killed them off - Zayl said. He noticed some blood splattered on the floor, with a trail going deeper into the fortress, as well as a corpse of a beheaded L'Taah nearby. - But another problem is, they woke the sodding sentries. - He continued. The interior of the blackstone fortress was very bright, with walls made out of beautiful white marble, and inside was as bright as day, with no torches of any kind providing lighting. there were beautiful murals depicting the history of Niveria before it was inhabited by humans, showing mostly scenes of the eternal conflict between the Old Ones and L'Taah. - The sentries pose no threat if you know their only weakness. - Zayl said - Hit them in the head. That's where their source of power is held. 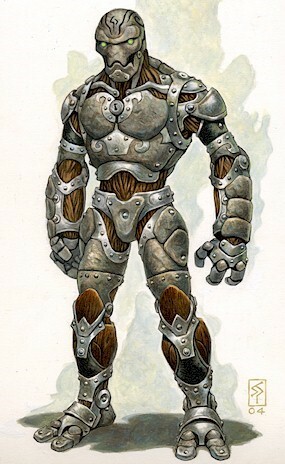 - He finished and readied himself for combat as several golems wielding poleaxes sprung to life. As the golems closed in on the group, Hassic unsheathed his sword and jumped backwards, just in time as one of them reached out with its weapon, almost landing it in his skull. Cold sweat began running down Hassic's forehead and he soon realized what he's gotten himself into. Another blow was heading for him, and he again dodged it. The golem swung its wapon effortlessly, it appeared as if it could go on like this for days without even stopping for a moment. One of the challenges was not only the relentlessness of the automata sentries guarding the Blackstone Fortress, but also the fact that their weapons gave them longer reach. The skirmish in the main hall was fierce. There were few dozen of the Old One's automata, and it gave the group quite the challenge. 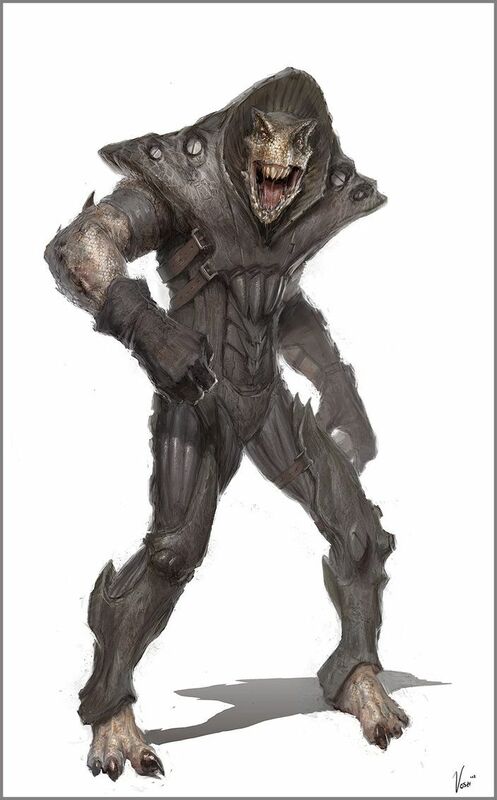 Morn managed to kill few with his arrows, before being forced into melee combat. Aellis had a bit more trouble with those attacking her, but had managed to take down few as well. Zayl on the other hand had put on a spectacle of acrobatics and fierce combat techniques. His ghostly blade thrusted, cut and slashed as the sorcerer performed areal acrobatics, as he evaded the razor sharp blades of the polaxes wielded by the automata. their weapons were shattered as Zayl finished off those automata that engaged him in combat. Each member of the expedition held their own against the golems quite well, despite being outnumbered and facing a seemingly tireless oponent. "That was... horrifying", Hassic said quietly, trying not to draw any more attention from possible sentries.